When a nation’s central bank raises interest rates, it’s often a bullish sign for the currency. Not so in the U.S., where expectations for a Federal Reserve rate hike next week are flashing sell signals for the dollar. BNP Paribas Asset Management says the broad greenback could plunge 10 percent in the next six to nine months, while Invesco Ltd. forecasts it’ll sink about 3 percent against the euro by year-end. Both firms are watching the Fed’s Sept. 26 decision for any comments on the impact of escalating trade tensions. The two companies also see the currency sliding as other central banks inch closer to monetary tightening. “We have a turning point where the dollar is going to weaken’’ said Momtchil Pojarliev, deputy head of the currencies team at BNP Paribas Asset Management, which manages $653 billion. The dollar is “at the maximum positive point” and could weaken to $1.25 per euro in the next six to nine months from around $1.17 in Wednesday trading. It’s also a good time to short the U.S. currency against the yen, Pojarliev said. The market views a 25 basis point Fed rate hike next week as a near certainty, based on fed fund futures. Contracts on Wednesday showed more than 45 basis points of total tightening by the end of 2018. Focus is increasingly shifting to the outlook for next year, with investors moving closer to the central bank’s projected path of three rate hikes for 2019. 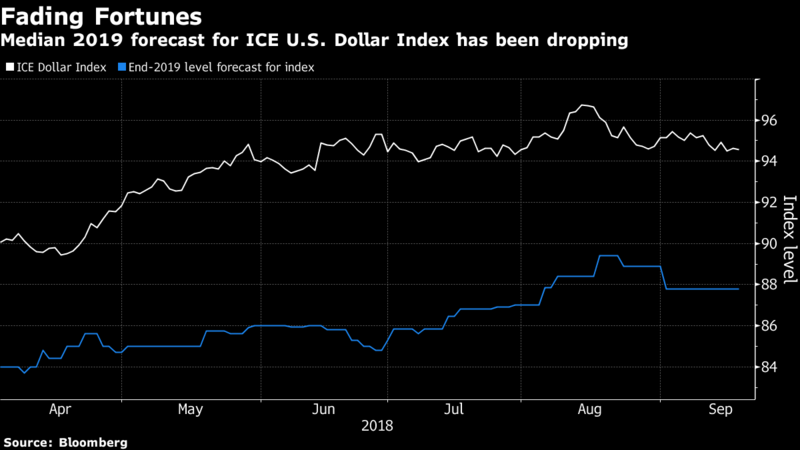 The U.S. currency has risen more than 5 percent since mid-April, bolstered by a robust economy, gradual tightening by the Fed and haven flows as investors sought refuge from escalating trade tensions. That’s been painful for investors who began the year with a bearish mentality following a 8.5 percent decline in 2017. 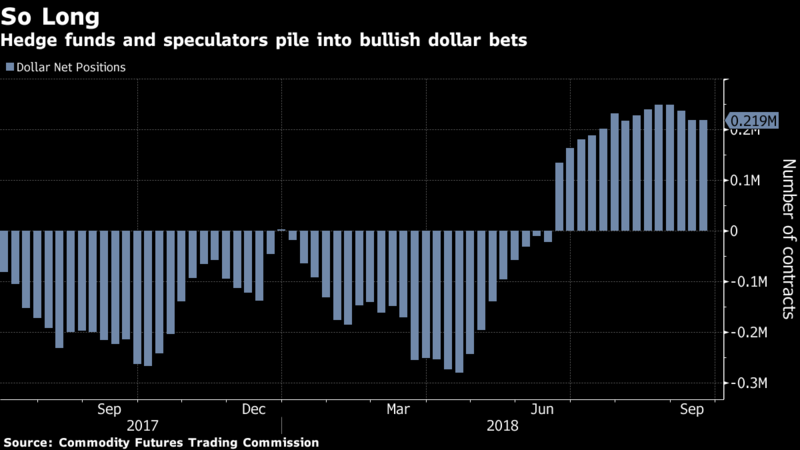 As the dollar started to gain steam this year, speculators piled into bullish bets. Long-dollar wagers are now the third-most crowded trade in financial markets, according to fund managers surveyed by Bank of America Merrill Lynch Global Research. And yet, prominent investors including Ray Dalio, who founded the world’s biggest hedge fund at Bridgewater Associates, and Jeffrey Gundlach, chief investment officer at DoubleLine Capital, are turning bearish alongside some Wall Street strategists.